Oil painting has been used for creating art works in Europe since the Middle Ages and since the fifteenth century this technique has been the principal medium used for creating art works. Many oil paintings have survived since the earliest periods although we are most familiar with the European paintings created since around 1500. Since the very earliest times it has been necessary to clean and restore paintings. Historically it was artists who carried out this work but by the 19th century there were a few established studios specialising in the cleaning and restoration of art works. But the work of cleaning and ‘tidying up’ paintings was often left to house decorators whose work was unskilled and frequently recorded as having disastrous results. Paintings are subject to damage by air pollution, sunlight, damp and humidity. Canvas can be torn and damaged, wood panels can be split or warped. Old fashioned coal, wood fires, gas burners and cigarette smokers would leave thick layers of grime and yellow deposits on the surface of paintings. 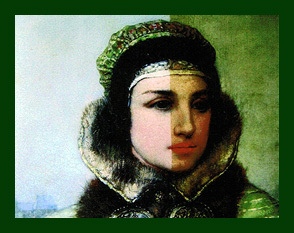 All of this can be repaired and removed by the expert restorer without damaging the surface of the painting. Old fashioned oil based varnishes discoloured in a short space of time and the use of substances such as carriage varnish that resist removal was not uncommon in previous times. Varnish applied to the surface of a painting protects the oil pigment from being impregnated by dirt. But when the varnish itself becomes discoloured and dirty it needs to be removed by a careful and slow process which causes no damage to the underlying paint surface. The painting can then be re-varnished with modern synthetic based varnish which lasts longer and does not yellow with age. Oil paintings that have suffered from the effects of time need care and skill to clean, restore and protect them for the future. Sometimes a dramatic result can be achieved, cleaning off layers of dirt and grime, old varnish and sometimes even old restoration to reveal the artist’s original work.